Plarium’s strategy/base-building title Soldiers inc. was launched on Facebook in 2013. The newest titled called Mobile Warfare is a sequel to the extremely popular MMORTS. Better graphics and animation, excellent gameplay and new features will appeal to mobile strategy lovers. The best part of this game is that it gives you ample chance to be prepared before attacking other players’ base or defending your base. An in-game tutorial will explain everything about the game and the building/upgrade/research missions will make it easier for you to build all key structures that are required to get resources and units. There are three main resources: Fuel, Munitions and Rations. You will require them to build/upgrade buildings and recruit troops. The resources you will receive as construction/upgrade rewards as well as enemy loot will keep piling up and you will need to free up some space for them. To do this, you will have to upgrade the Supply and the Cold Storage depot. 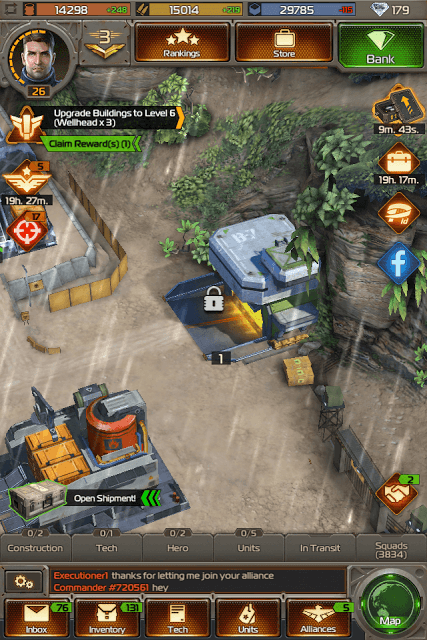 To store rations (box icon), you will need to build Cold Storage depot. To increase storage capacity, upgrade it. You can build up to 3 Cold Storage depot. The Supply Depot stores fuel (barrel icon) and munitions (bullet icon). You can increase the building’s storage capacity by upgrading it. Tap any one of these buildings; hit the info screen and then tap “Full Upgrade Stats” to know the amount of resources it can store. Build and upgrade drop zones to get rations per hour. You will need a certain amount of fuel and munitions to upgrade it. You can build up to 6 drop zones. Keep upgrading them to receive more rations per hour. 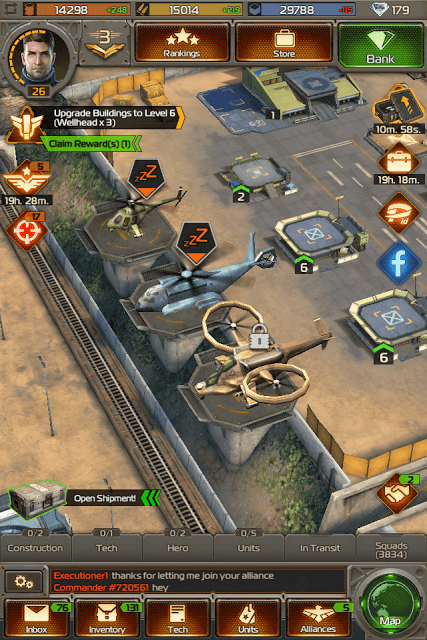 To decrease ration consumption of your troops and buildings, you will have to build Control Tower, which is located close to drop zones. One of your drop zones should be at level 10 to unlock it. You should then upgrade the Control Tower to level 1 and then level 2 for a 2 percent reduced consumption. Keep upgrading to increase the reduced consumption percentage. The Wellhead produces fuel. You can build a maximum of 6 wellheads. Don’t forget to upgrade all wellheads to increase fuel production and capacity. Check the “Full Upgrade Stats” list, which can be found by tapping a wellhead. It will give you a complete list of fuel production rate and capacity at every new level. To boost fuel production, you will need to build and upgrade “Refinery”, which is located close to wellheads. Upgrade one of the wellheads to level 10 to unlock this building. Next, upgrade the refinery to level 2 to get a 2% fuel production boost across all wellheads. Keep upgrading it. When upgrade it to level 6, you get a 10 percent boost. Munitions factory produces and stores munitions. You can build up to 6 munitions. Upgrade munitions factory to increase production and capacity. Don’t forget to build and upgrade Munitions Fabricator if you want a production boost. This building increases your base’s total munitions production by a certain percentage. You will need at least one munitions factory at level 10 to build the fabricator. At level 2, you will get a munitions production boost of 2 percent, which will increase to +2% after each upgrade. At level 8, you will receive a 20 percent production boost. Access Resource Runs to get resources as rewards. Tap helipads near drop zones to send choppers to resource run missions. Tap a helipad and then press the “Start” button to send a chopper. You will receive resources and EXP when it returns. The time taken for a resource run can be seen just below “Category” and “Location” of a mission. The first mission usually takes less time to complete than others, so you should try that first. However, if you need lots of resources, then start the “Large Haul” missions. Connect with your friends on Facebook via the “Recruit Center” (located on the outskirts of your base). You will receive a reward, which could range from resource to time boosts and other items, every time a friend joins. You will get more rewards every time a friend hits player level 15. Complete building construction/upgrade missions to get free resources. These missions can be seen at the upper-left corner of the screen, just underneath your profile icon. You can also request resources from alliance members. 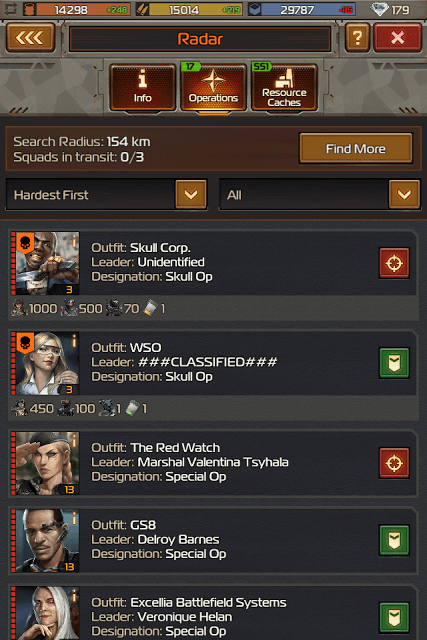 Join an alliance and then tap the Alliances tab. Next tap the “Combat Support” tab and go to “Resources”. Press the Create Request button and drag sliders for each resource. Now press the Create button to send a request. You can hire troops via barracks, but it will take several minutes if you recruit more number of soldiers. There’s, however, a way to get them for free, and you don’t have to wait for 20-30 minutes or more. All you have to do is carry out special and skull operations to get them. Operations are offensive and defensive in nature. You will be defending/attacking AI outfits and in return get plenty of rewards like troops, resources, boosts and other items. There are two main types of operations: Reinforcements and Raids. The former lets you protect AI bases from an enemy and the latter lets you invade AI enemies. To access a special operation, tap the red bulls-eye icon on the left side of the game screen. A green badge beside an operation suggests it is a defensive operation, whereas the red badge suggests offensive ops. The game sorts ops based on their difficulty level (Hardest to Easiest). Completing the hardest special op will grant better rewards, including advanced units and more number of troops. The operations screen is by default set to “Hardest First”, so you just have to choose the first few missions and complete them to get better rewards and units. Tapping an offensive or defensive operation will take you to a new screen where you can choose your squad. Let the AI choose the best units by tapping the “Select Strongest Squad” checkbox. Now press the “Send” button to send your squad to an offensive/defensive special operation. Achieving victory in a special operation also grants Elite points and EXP besides resources and troops. You may also get troops from “Shipment”. The shipment icon can be seen at the lower-left corner of the screen. After collecting rewards from a shipment, you will have to wait for a few more minutes to get a new one. The game will notify you when new shipment arrives. Your first objective is to recruit as many troops possible. You can hire troops at the barracks or get them for free by completing special/skull ops. Don’t forget to research combat-related technologies such as paratrooper speed, paratrooper offense, commando offense and defense, hiring speed, commando speed etc at the Tech Center. Research takes time to complete and unfortunately you cannot request speedup helps from alliance members. Once you feel you are ready to invade other players’, tap the map icon at the lower-right corner of the screen and pinch-out to zoom-in and locate player bases close to your base. Target lower-level bases, but don’t attack protected bases (they have a blue shield icon above them). Once you spot one, tap to check attack options. You can directly raid a player base or request attack from your alliance. Make sure to set the duration to 1 day or so in case you want to get heard and request accepted. (Also join an alliance that has several members. Chances of getting building and combat support from members are lower if an alliance has fewer members). You can send a recon unit (Stalker Scout) to get key information about the player base. You may fail to recon some bases and lose your stalker scouts. 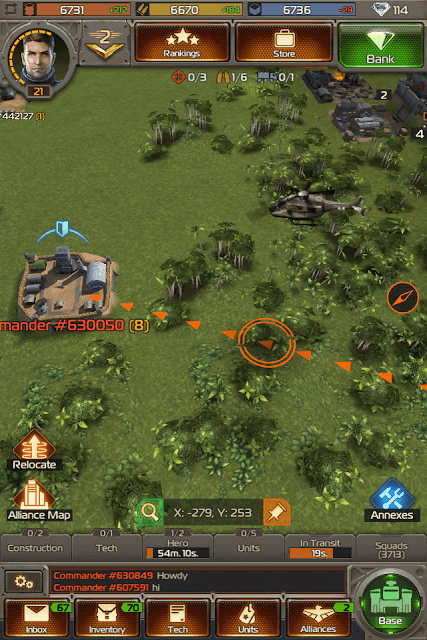 If you are confident that you may win and have lots of troops with you, then you may attack a a lower-level base directly without sending recon units. The recon unit brings info such as number of troops your target currently has at his base. Send your best units by tapping the raid button and then selecting “Send Strongest Squad”. The game will automatically select the best troops for the raid. The father away the player base from your base, the more time it will take for recon units/troops to reach it. So scan lower-level bases located near your base first and raid them before targeting those that are located farther away from your base. Located between Supply Depot and Munitions factory, the bunker can be unlocked when you reach player level 29. Once you unlock it, you will have to upgrade the building to level 2 to be able to hide your resources and units. When an enemy attacks, he cannot destroy or loot the amount of units and resources protected by your bunker. Keep upgrading the bunker to increase the amount of resources and troops that can be protected by it. 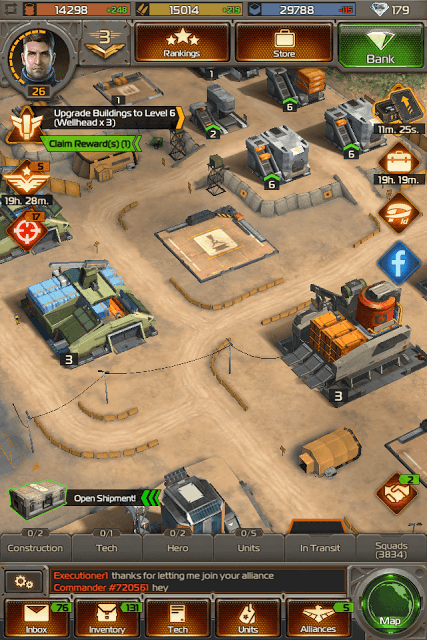 Winning operations can be the best way to get lots of resources, troops, gear, nano packs and other items. You can get access to these operations by tapping the Radar, which can be found near drop zones. Upgrade the radar to increase its search range. This will allow access to various new operations, including Skull Ops, which provide lots of units. To upgrade, tap the Radar and then tap the “Info” tab. Next, press the upgrade button. You may have to fulfill some requirements, such as upgrading your command center to a certain level before you can upgrade it.